To stimulate start-ups creation and entrepreneurship, Forum EPFL organises a dedicated evening for students interested in those areas. Success stories, workshops and a networking aperitif will all be opportunities to meet and share knowledge between professionals and students. Tackle the challenges of creating start-ups and making them grow together. Login to your Forum EPFL account or create one if you have not already done so. Upload your CV and fill in your information to confirm your account. 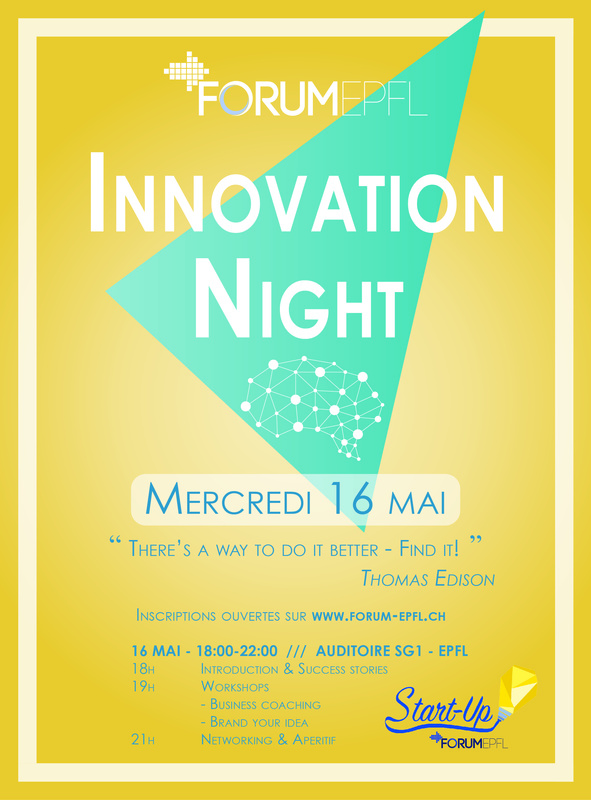 Sign up through the “Collective services” tab and write a short message describing your project and/or your motivations to join us at the Innovation Night. The Innovation Night will start at 6pm with a conference “Start-up Success Stories”. Coaches and experts for the evening will be introduced then. From 7pm, you will form groups of 10 people, depending on affinities and on the workshops you will have chosen. You can also come with an already formed team by registering to the event together. Come share and confront your ideas to create a better future together!